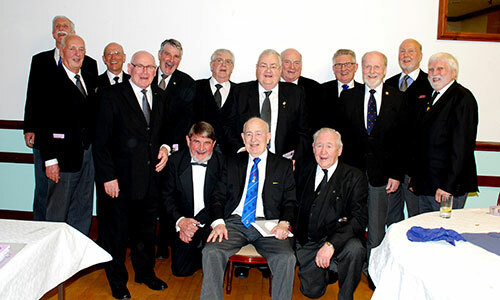 It was a very special occasion when the brethren of Eureka Lodge No 3763 and a large number of brethren from the Ormskirk and Bootle Group, along with the many guest from within the Province and from the Isle of Man, gathered at Liverpool Masonic Hall, Hope Street, Liverpool, to celebrate the important milestone in the Masonic career of William Frederick (Freddie) Wright in achieving 50 magnificent years as a Freemason.. Leading the evening’s celebration was Assistant Provincial Grand Master Frank Umbers, who was accompanied by Past Deputy Provincial Grand Master Howard Jones, Past Assistant Provincial Grand Master John Moore, Ormskirk and Bootle Group Chairman Graham Chambers and vice chairman Malcolm Alexander. Also, at the meeting there was a delegation from the Isle of Man, which was led by its Provincial Grand Master Keith Dalrymple and a large number of around 40 grand officers from the group, Province and from the Isle of Man and a number of acting Provincial grand officers, with a total of over 120 Masons attending. The evening’s meeting commenced with the WM Richard Snape, warmly welcoming everyone to the celebration before opening the lodge. Once the lodge’s initial business had been completed, whereupon the Provincial Grand Director of Ceremonies Keith Kemp, was admitted into the temple and announced that Frank Umbers was without and demanded admission. Therefore, he was duly admitted into the temple preceded by the PrGM of the Isle of Man Keith Dalrymple, the senior grand officers and the acting Provincial grand officers. Freddie was born in 1936 to Esther and William Wright at Walton Hospital, in Liverpool, there home was at Cullen Avenue, Bootle. When Freddie was about four years of age, just after the start of the Second World War, the very important strategic location of the Port of Liverpool was experiencing, heavy and sustained bombing by the German Luftwaffe, and Cullen Avenue being less than a mile away from the port’s main docks Freddie’s family was in great danger. Freddie’s mother made the decision to have him evacuated to Builth Wells in Wales. On his return to Liverpool, Freddie went to Orrell Primary which he attended until the age of 11, Freddie then attended Roberts Drive, Senior School until aged 15 when he left to start as a Joiners Apprentice at Bootle Corporation. But due to a mix-up Freddie could not start straight away so he applied to Scots Bakery as a van lad until such time as he could start his apprenticeship at Liverpool College of Building in 1952. To enable Freddie to complete and attain his intermediate City and Guilds Certificate he was allowed a deferment from National Service until he was 21 years old. Freddie was called up in 1957 and was told that on completion of his basic training he would be sent to a local College of Building to take his final City and Guilds examination. However, as soon as his training was complete Freddie was put into the Royal Artillery Regiment and was posted to Malta with no sign of a college in sight. Being assigned as the officer commander’s driver and spent a very tough and gruelling 18 months driving all over the island of Malta with the Land Rover top down, wearing his shorts and drinking cold bottles of Coca Cola. The army explained, once he had finished his National Service, he could start at Liverpool College of Building and take his final City and Guilds. In 1959, Freddie signed up for Liverpool City College of Building and only with 12 months of studying before sitting and passing his final examinations. During this time, one Saturday in June 1960 he met the love of his life Myrna at the Saturday night Litherland Town Hall Dance and were married in 1964 at St Andrews Church, Bootle. Freddie and Myrna are blessed with four sons, Gary, David, Stuart and Alan and the Wright dynasty has been further blessed with seven beautiful grandchildren. In April 1965 they both decided they would like to immigrate to New Zealand and filled in an application form for a classification as a post primary or manual teacher, for which Freddie was accepted. Moving into a caravan on the waterside of a holiday park near Auckland harbour with their son Gary, which had a wonderful view out of the window of all the large liners going into and out of the harbour and in 1970 Freddie and his family returned home. In 1972 Freddie started his own business ‘Wright Contractors’ specialising in the renting and installation of mobile classrooms and offices. The business proved very successful and is still run today by his son Stuart. Myrna very sadly passed away in July 2015 with Frank saying: “I know you miss her very much”. Frank then gave a detailed account of Freddie’s Masonic career. Freddie was initiated into Eureka Lodge on 27 March 1969 and was proposed by Captain Charles Phillips, being installed as WM in 1982. In 1989 Freddie received his first Provincial appointment and was appointed as a PrGStwd, joining Quingenti Lodge No 8516 the same year and becoming the lodge’s almoner in 2003, an office he still holds to date. Freddie joined Lathom Lodge No 2229 in 2001 and served as charity steward from 2010 to 2012 when he was appointed as the lodge almoner. In 2003 Freddie was appointed as the first ever Bootle Group Local Care Officer a post he held for 12 years. At the Provincial Grand Lodge meeting in 1993 Freddie received his first Provincial promotion to PPrSGD and in 2000 he was promoted to the very high rank of PPrJGW. On 28 April 2004 at the Grand Lodge meeting in Great Queen Street, Freddie was appointed to the grand rank of PAGDC and in 2013 he was promoted to the very high rank of PJGD. 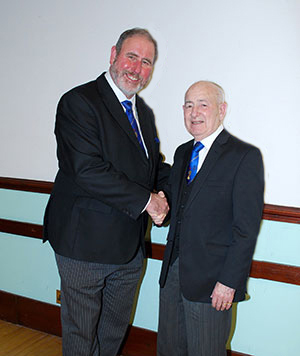 In addition, Freddie became a joining member of the IOM Lodge of Installed Masters No 9598 in 2011, Manchester St David’s Lodge No 1147, in Hereford and in 2015 and were one of the founding members of Henry Callow Lodge No 9916 in the IOM. 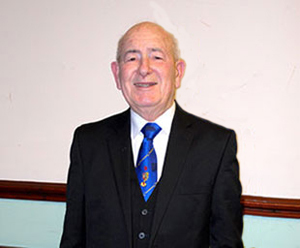 Freddie was exalted into Thornton Chapter No 8008 on 25 November 1983 and became its first principal in 1988. In 1995 Freddie received his first Royal Arch Provincial appointment of PPrAGSoj. In 2010 he was promoted to the rank of PPrGSN and in 2014 Freddie was promoted again to the very high rank of Past Provincial Grand Scribe Ezra. Freddie, you have spent years raising money to support research into Pancreatitis and Pancreatic Cancer, indeed you and Myrna set up PALMA (Pancreas and Liver Masonic Account). The Pancreatic trust to help raise funds for the Pancreaticobiliary Unit in the Royal Liverpool University Hospital. Over many years you have made personal donations of mobile buildings from your company to numerous charities around the UK such as EMMAUS – The Cambridge expansion appeal, the Sea Cadets and many more organisations. Highlights from the festive board.